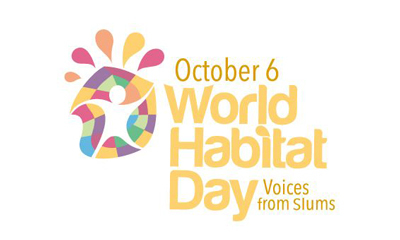 Monday, October 6th is World Habitat Day – an event created by the United Nations to draw international attention to the importance of the built environment in achieving development goals and to raise awareness of healthy shelters as a basic human right. This year’s theme, Voices from Slums, will draw global attention to the conditions in informal housing settlements around the world, facilitate the development and implementation of processes to alleviate the numerous problems faced by residents, and call upon both local and international policy-makers and leaders to address the manifold problems associated with slums in a substantive manner. The sad reality is that the poorest and most vulnerable among us face the harshest and deadliest of living conditions. With rapid urbanization, dense and dangerous slums are a common feature in many cities around the world. High rates of disease and premature deaths are often hallmarks of these substandard living environments. Diseases of poverty, such as tuberculosis, malaria, and diarrheal illnesses, are rapidly transmitted and have devastating effects on the families and communities. As an organization working at the intersection of architecture and public health, we at ARCHIVE Global address many of the issues highlighted by this annual event. We believe that healthy homes are vital to health and well-being. We work in some of the world’s most vulnerable environments to develop and deliver architectural interventions within impoverished communities. In Haiti, we are working on improving ventilation in a community suffering from the dual burden of TB and HIV/AIDs. In Cameroon, we are implementing interventions to reduce malaria rates in urban homes. In Camden, New Jersey, we are tackling the common indoor triggers of respiratory illnesses to combat crippling rates of asthma among children living in poverty. Our goal is two-fold. We implement cost-effective solutions that can be easily replicated and scaled up by the larger community, while also directly training community members on the most critical health issues and building practices to create a sustainable future for these communities. 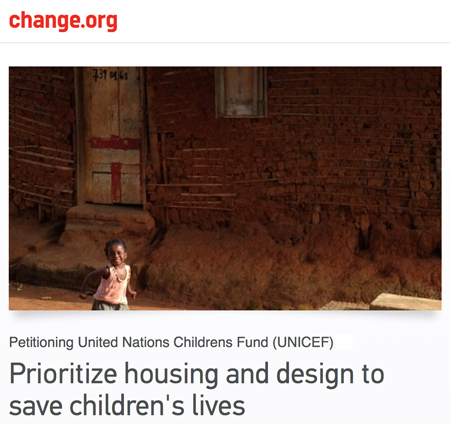 Sign our petition urging world leaders to prioritize housing as an essential pillar of public health and, more broadly, development. A powerful way you can support our work and World Habitat Day is by signing our online petition urging world leaders to prioritize housing as an essential pillar of public health and, more broadly, development. We are excited about High Fives, our new project in Savar, Bangladesh, where we are working with residents of a marginalized community to replace disease-spreading dirt floors with cleaner concrete floors. Over 750,000 children die each year as a direct result of diarrheal sickness. We want to drastically cut down that number. The fact is that this heavy morbidity and mortality is preventable. Dirt is literally a breeding ground for parasites and bacteria. High Fives is based on the public health principle that children who survive past their 5th birthday are more likely to live into adulthood. High Fives will reduce rates of diarrheal diseases among children in one of the poorest communities in Bangladesh. Working with our local partners in Dhaka and with a team of dedicated and talented architects from various universities and firms, we have developed a cost-effective and scalable flooring project. We are replacing dirt floors with strong, cleanable concrete floors and empowering the local community with the financial resources and training needed to replicate this model. This project is unique in that we’re using a crowd-funding model that allows and relies on individuals, organizations (such as schools, student groups, and clubs), and businesses to create their own campaigns to fund the floors for individual families. We hope that this project will allow donors and supporters to take on a more active and rewarding role as part of a high impact development project. We strongly believe that, working together, our supporters can deliver simple, powerful, and lifesaving housing solutions for families and communities around the world.